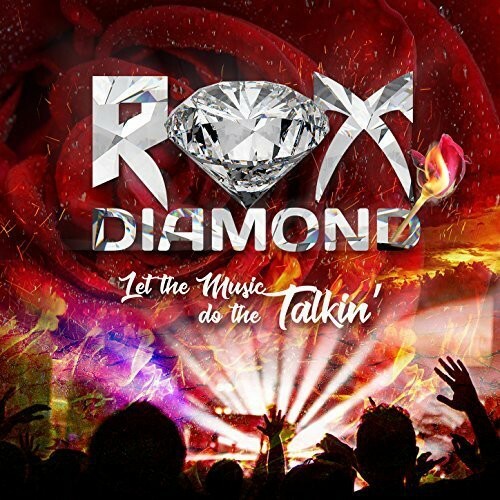 Rox Diamond's first two albums, the self-titled debut and follow-up 'Powerdrive', have been played many times over the years here at Johnson Towers. Then getting to see and meet them at Firefest was a real fanboy moment for me. Yet it's been pretty quiet on the Rox Diamond front since then, that is until rumours started to surface that singer/keyboard player Paul Daniels and the band were once again working on a new release, and here it is. 'Let The Music Do The Talking' is instantly recognisable as a Rox Diamond record, that old sound of theirs is in every nuance of this album's songs, but with that added maturity only many years of writing music can bring. 'Savannah Blue' is up first and it's a top draw melodic rocker with a big hook and some great musicianship rounding things off. The title track comes next, and with its almost Mötley Crüe-like riff that's smoothed out by Daniel's clever keyboard work, this song shows off the maturity that I was talking about above. The ballad 'You Can Never Love Somebody Too Hard' has another classy chorus, something this band specialize in, and tracks like the up-tempo 'Angeline', the riff-tastic, retro eighties rocker 'The Way I Feel', 'Lonely Without You', 'Never Say Goodbye' and the superb Journey-like 'Midnight Girl' all go to prove that this band should and need to make albums on a much more regular basis. Three albums in twenty-six years puts the Def Leppard guys to shame. Yet maybe this isn't all about quantity but instead, it's about the quality of the music; Rox Diamond certainly do have that quality to spare. Their song-writing, musicianship and classy sound all make for a great Melodic Rock album that we as fans reap all the benefits from. Hopefully, with 'Let The Music Do The Talking', Rox Diamond will feel the need to continue to record new albums and not have such big gaps between them again, which in the end can only be a good thing for them and us. This is a great album from a great band.